(String quintet: 2 violins, 2 violas, 1 cello). and by J. Christopher Kennedy for Pacific Serenades. Three movement work. 26 pages (score), 8.5" x 11". Premiered on March 8, 2003 in Los Angeles, CA. Recorded in June 2003 in Los Angeles, CA. One movement work. 15 pages (score), 9" x 12"
Current Events is featured on the 2007 Innova Recordings CD, Notes from the Kelp (innova 683). Click CD for more info. "The new work was Alex Shapiro’s Current Events, which was receiving its second performance hereabouts and deserves circulation. Her title, by the way, refers to her hobby, which has something to do with “communing with the sea life at tide pools.” It’s music exceptionally well made... I found it most attractive, especially in a long, beautifully unfolding slow movement. In her pre-performance talk [Shapiro] kept invoking the ghost of Brahms, but I think she sold herself short on that count; her string scoring had little of the thickness with which the good Doktor was often given to burying his best thoughts. I wonder if he ever caught the romance of a tide pool." "Listen Up! Don't ask any questions. Simply go to this page, and click on each of the three MP3 excerpts from a composition (a string quintet) titled ... Current Events. It will do wonders for your heart, mind, and soul, and convince those of you who regard the 21st century as a bleak one for worthy new classical music (among whose number I often count myself) that perhaps things are not nearly so bleak as they might at times seem..."
"My favorite piece so far is Current Events, for string quintet (adding a viola to the traditional quartet). 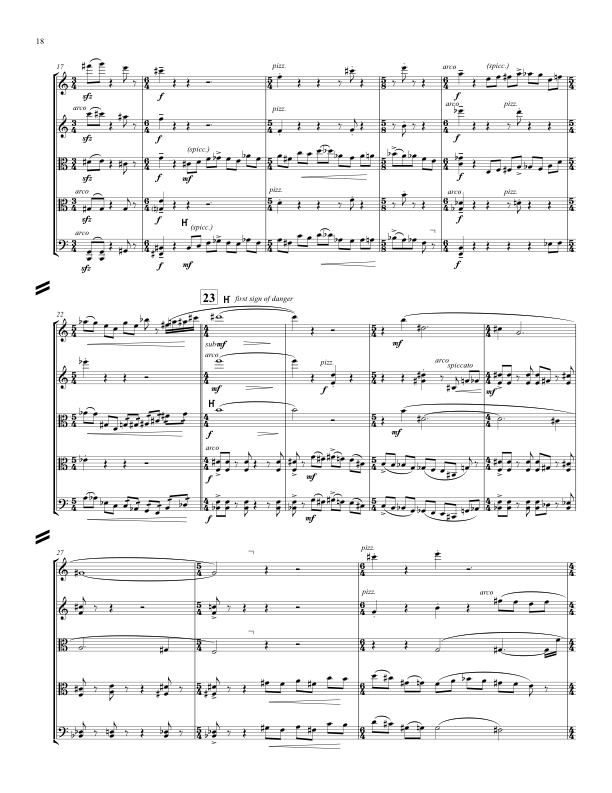 The piece is well-written for the instruments, expressive, and compelling." "The string quintet Current Events is where Alex's architectural mastery comes into play... she does not waste notes. All are purposeful and directed. It's an interesting anomaly, because where she repeats phrases or shapes, the weight of that repetition is felt in the substance of the composition... the thematic material is highly expressive (the end of the second movement is a model of expressive composition, and should be studied by any composer to discover how to achieve effect without pretense) and she has the string quintet in hand in the way George Rochberg used to -- large, lush harmonies paired with driving rhythms and contrapuntal clarity. No Ars Nova counterpoint here -- it's fragmentation and a driven response, unfettered by some imaginary audience awaiting the pabulum of the accessible. This piece has guts through and through." 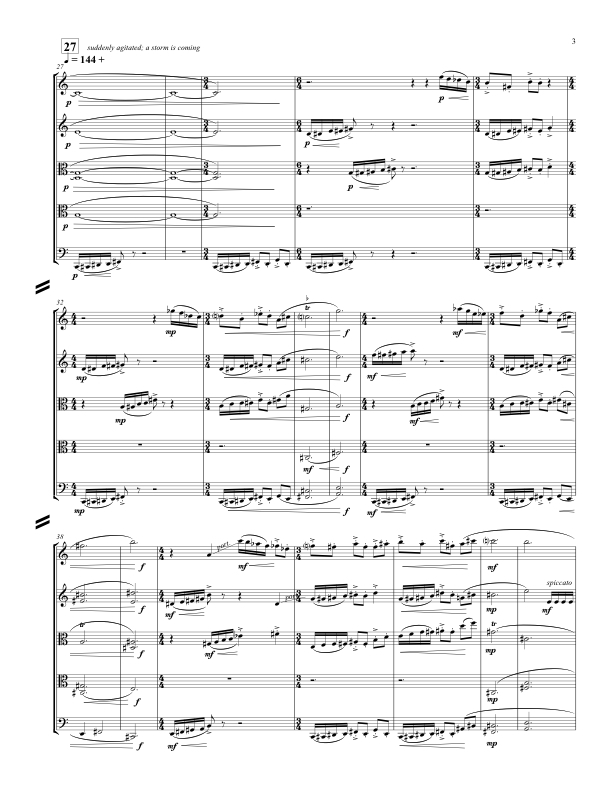 "The centerpiece of Notes from the Kelp (for us, at any rate) is “Current Events”, three thematically and musically related essays on the sea written for string quintet (2 violins, 2 violas, and 1 cello)... the three named movements are “Surge”, “Ebb”, and “Rip”, all referring to ocean tidal currents (“Current Events”, get it?). The musical language shared by all three is richly dissonant and dark-textured; a dense polytonal chromaticism that’s gorgeously and unabashedly romantic and deeply affecting. If there’s but one work on this CD that all will love, this is it, and were it the only work on the CD, it alone would justify the purchase price." 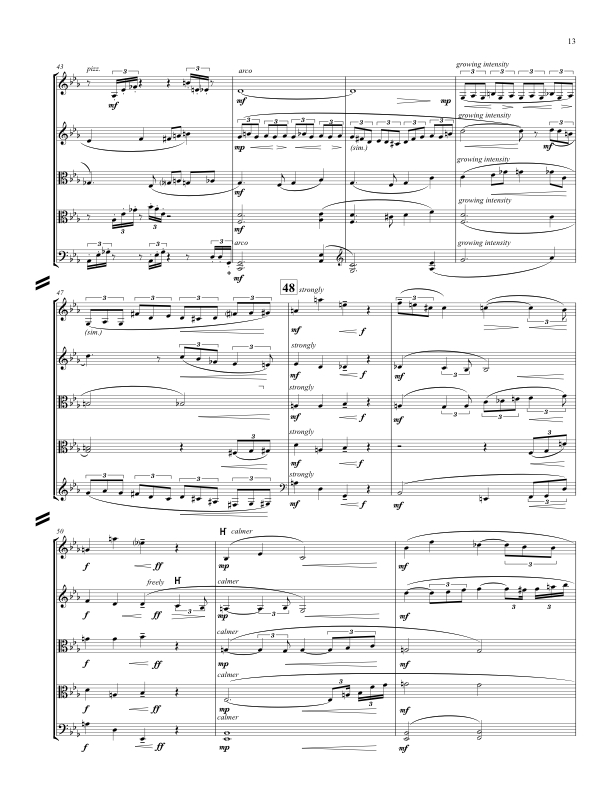 Score and parts available from Activist Music for $45.00, print; $32.00 digital. Current Events ponders the ocean's tides as well as waves of a more internal, emotional nature. Living very near the water, communing with tide pools has been a constant in my life: if I weren't a musician I might well have become a marine biologist. As our above-sea level world continues on its restless and sometimes frightening path, I walk to the ocean for truth and a mirror. Staring into the water I seek out life forms that encounter their own dramas, good and bad, with each wave. I wonder how, like us, they endure. The power of a storm surge creates a much higher tide level than predicted under normal weather conditions. In this instance, the storm to which the music refers is as related to world events as it is to oceanic ones. Ebb tides expose the shoreline at its most private, and reveal creatures usually hidden under deeper waters. The music of this second movement addresses loss, grief and uncertainty, as life's own protective tides occasionally pull away and leave us equally naked and vulnerable. Dangerous rip currents are unexpected and challenging, pulling objects, human and otherwise, involuntarily away from shore. As with so many things in life, such threats can be overcome by calm and measured action. Like the ocean's currents, change in life is constant. It's how we adapt to the flow that makes all the difference.